Hello, everyone. My name’s Polar Bear and I’m an Ascension junkie. I have every boxed expansion that’s come out for the game as well as most of the promo cards as well. So when I saw that Stone Blade Entertainment was coming out with a new set at Origins, but I wasn’t going to be at Origins, I called up my friend who was going to be at the show and had him pick me up one. They got back earlier this week and I got my copy. So, as it’s my thing to do, I decided to give you a review of it. So double check whether it’s AM or PM. It’s time for another TGN Review. 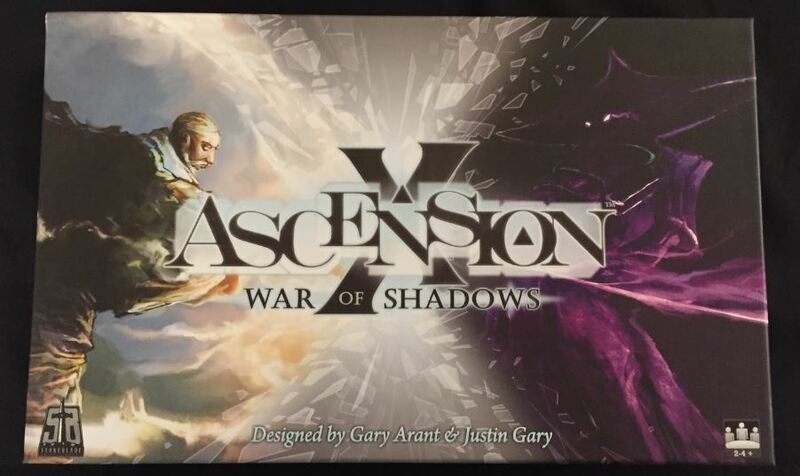 This time it’s Ascension: War of Shadows from Stone Blade Entertainment. As I’ve done for games like Munchkin and Fluxx (that is to say, games that I’ve done multiple reviews of various editions of them... such as Ascension, even, as you can see here and here), I’ll start this review with a general overview of how Ascension plays, then go into what makes War of Shadows different. 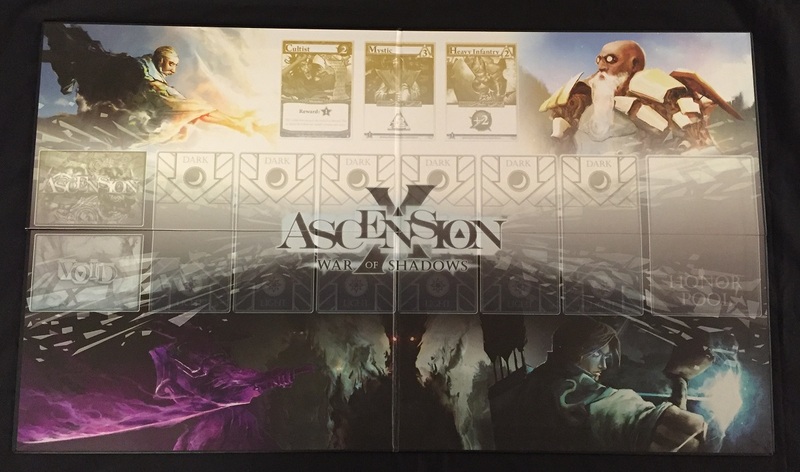 Ascension is a deckbuilding game. That is to say that players all start out with small, identical decks of cards that they draw from. As the game progresses, they will alter that deck by buying new cards, or removing cards from their deck. The object of the game is to have the most victory points (VPs) at the end. You gain VPs by buying cards for your deck as well as defeating monsters. 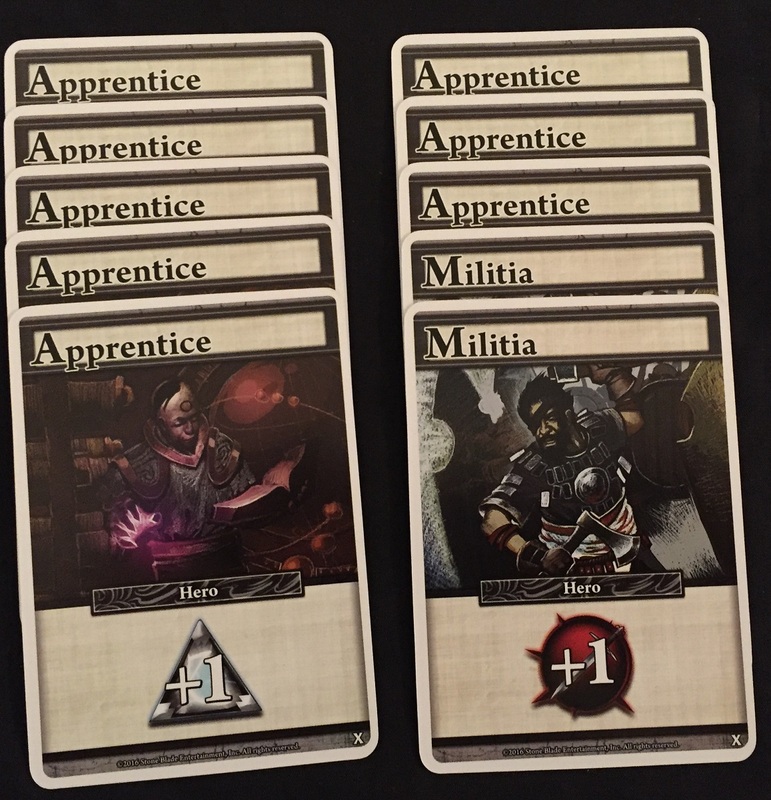 The game contains three types of cards: Heroes, Constructs, and Monsters. Heroes are various warriors (or sometimes just peasants) that you play from your hand to gain either resources or some other sort of bonus. Constructs you play from your hand, but they stay in play, giving you some sort of resource or bonus each turn. Monsters are cards that don’t actually go into a player’s deck, but are defeated out of the Center Row and gain the player Honor (VPs). Setting up a game of Ascension is rather easy. 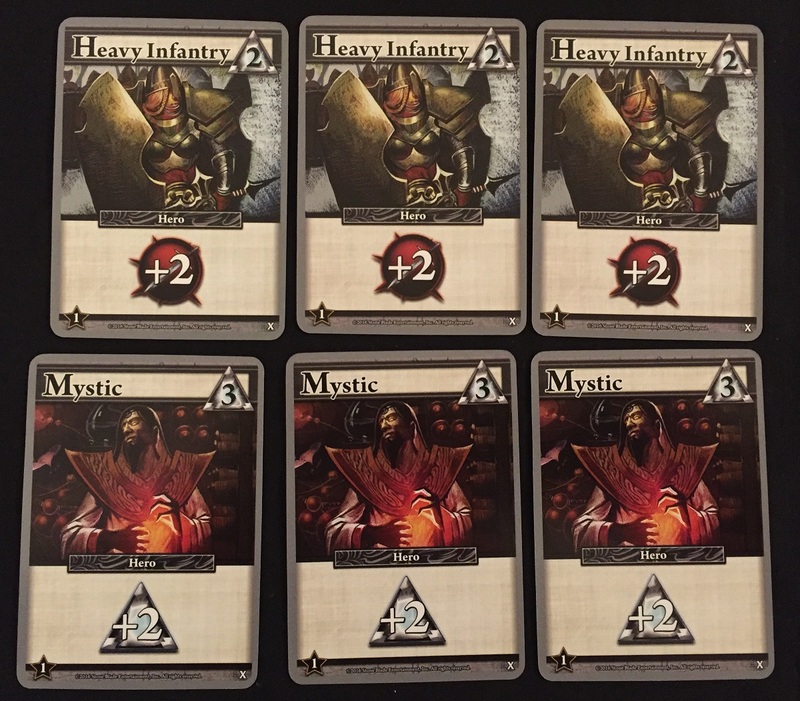 Players each get a Starting Deck consisting of 8 Apprentice cards and 2 Militia cards (any Starting Deck cards not used are set aside. They won’t be used this game). The board is set up where everyone can reach it. There are spots for Heavy Infantry, Mystics, and the Cultist card. The rest of the cards are shuffled together to create the Center Deck. Count out Honor tokens for each player playing. There’s 30 points used for each player. So, for example, a 2-player game would use 60 Honor. 3-player would use 90. Randomly determine who will be the first player. Then, take the top 6 cards of the Center Deck and place them out into the Center Row on the board. Players shuffle their Starting Deck and draw 5 cards. They’re now ready to begin the first turn. On a player’s turn, they’ll play cards from their hand. Most of these cards will gain you either Runes or Power. 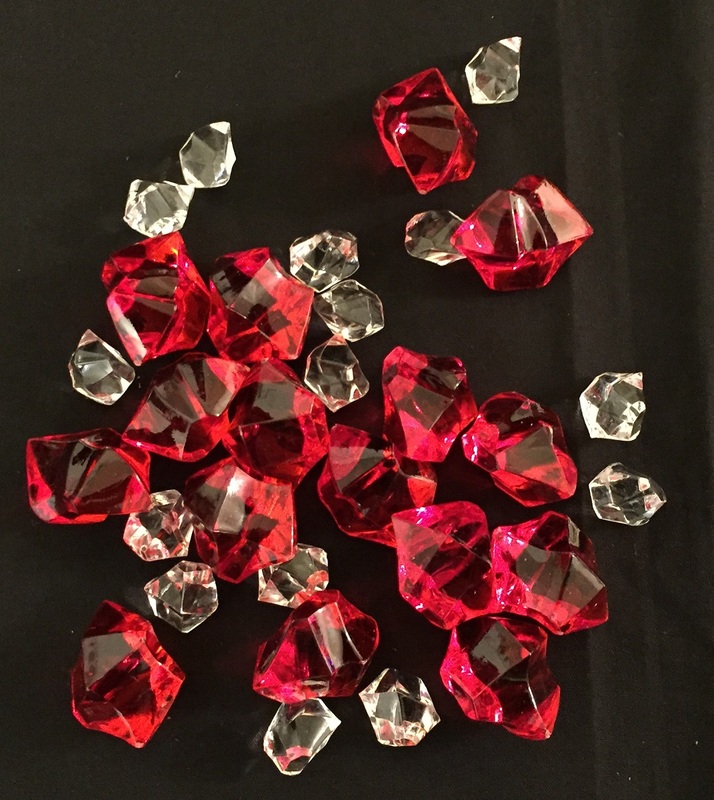 Runes are the main currency of the game, used to buy other Heroes and Constructs. Power is what is used to defeat Monsters (and also to buy some cards, but I’ll get to that in the “what’s different” portion). These resources are not held over from turn to turn. “Use ‘em or lose ‘em” is the motto. Other cards might let you draw more cards from your deck, or gain VPs directly from the pool, or any number of other things. Ascension is very much a RTC game. RTC standing for “Read the Card.” They’re very good about making it so whatever the card says is exactly what you do. No having to interpret rules that aren’t fully spelled out on the cards. Anyway, as players play cards, they’ll buy Heroes and Constructs from the Center Row, as well as defeat Monsters. As a card is purchased/defeated, it’s immediately replaced by a new one from the Center Deck. So there’s always 6 cards out there to choose from. So, for example, you could buy a low-cost card looking to see what might show up next before you decide your next purchase. Purchased cards go into your Discard pile. Defeated Monsters go into the Void. If you don’t see anything in the Center Row that you want (or can) purchase, you can always purchase Heavy Infantry and Mystics. As for Monsters, if you don’t have any Monsters out there you want (or, again, can) defeat, you can always defeat a Cultist and gain VPs for doing so. Players will use all the cards in their hand every turn. There’s no retaining cards from turn to turn. If you don’t want to use a card, you don’t have to, but you’ll still discard them at the end of your turn. Heroes you played on your turn also go to your Discard pile. Constructs, as I mentioned above, stay out from turn to turn. They can potentially get Destroyed, and that will send them to your Discard pile, but in general, they stick around. The last thing you do on your turn is draw a new hand of 5 cards. If you don’t have enough cards in your deck to draw a full 5, take your discard pile and shuffle it, creating a new deck, then fill up your hand. In this way, cards you play and cards you purchased get cycled back around and up into your hand. Play continues until the Honor Pool is depleted. The game doesn’t end immediately when it does so, though. That only signals that this will be the final round. So if you’re playing a 3-player game and the Honor Pool empties out during the 2nd player’s turn, they will finish their turn and the 3rd player will get their full turn. They can still gain Honor. Just use extra tokens, or some other way to keep track of Honor gained (my group usually sets aside extra Heavy Infantry and Mystics, as they’re worth 1 Honor apiece). When the final player has finished their turn, everyone counts up how many VPs they have. They count up the amount their deck is worth (Honor is the number in the star in the bottom corner of the card) and add in the number of Honor tokens they’ve gained from defeating Monsters. The one with the highest total wins. 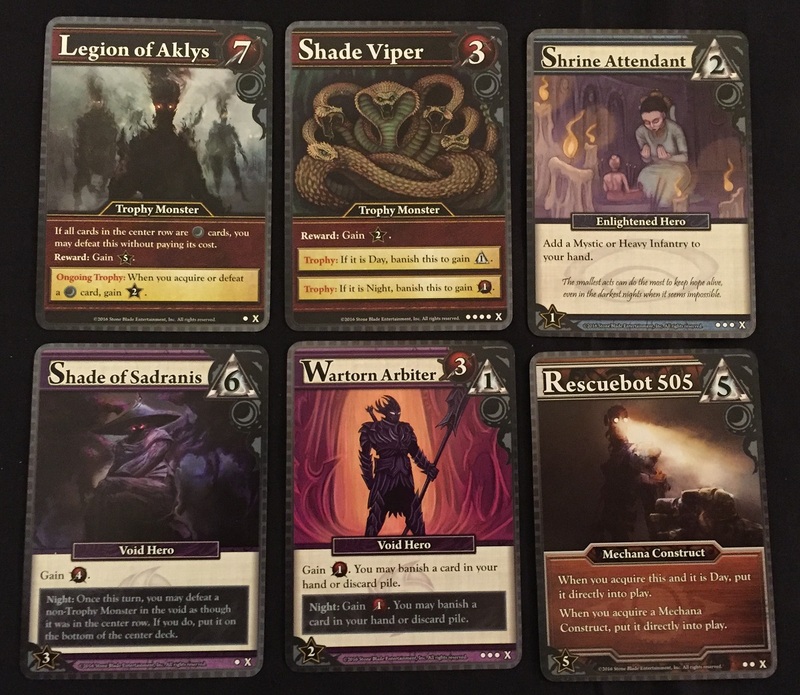 So, what sets War of Shadows apart from other Ascension sets? There’s one big thing, a medium thing, and a couple minor things. The big thing is the addition of “Day” and “Night” cards. All the cards that are in the Center Deck have either a black or yellow border. The black border cards also have a crescent moon in the upper right. The yellow border cards have a stylized sun. When the Center Row has more of one type or the other, it’s considered that time. So 4+ Night cards, it’s considered Night. If there’s 4+ Day cards out there, it’s considered Day. If there’s 3 of each, it’s neither Day nor Night. Many cards have certain extra rules depending on which time of day it is. These are all beneficial effects. So you might get extra Runes or Power by playing a card when it’s Night. Or a monster might be easier to defeat when it’s Day. There are a few cards that have effects for both Day and Night. The time of day is taken into account whenever you play the card or defeat the monster. So it might change back and forth several times during your turn as you purchase/defeat cards in the Center Row and they get replaced. As for the “medium thing” that’s different about this set, it’s that there are some Hero and Construct cards that cost both Runes and Power in order to purchase them. Before now, those types of cards only required Runes to buy. It’s a slightly different sort of mechanic and can alter how you choose to build up your deck. In terms of the “minor things,” those come into play in the text for a few of the cards. Usually, Mystics and Heavy Infantry are cards you only buy when you don’t have anything better to do with your Runes on a turn. Except for occasionally letting you acquire them more easily, most Center Deck cards didn’t interact with them. However, in this set, there’s a few that will give you bonuses for playing Mystics and Heavy Infantry along with them. Even though it’s only a couple of cards that do this, it’s nice to see Mystics and Heavy Infantry become a bit more of the strategy of deck-building. Another minor thing is a 1-cost Monster. Most sets don’t have these, but it’s nice to see if you have a turn where the only Power you’ve got is a single Militia in your hand. So they can be used for something instead of just being wasted. 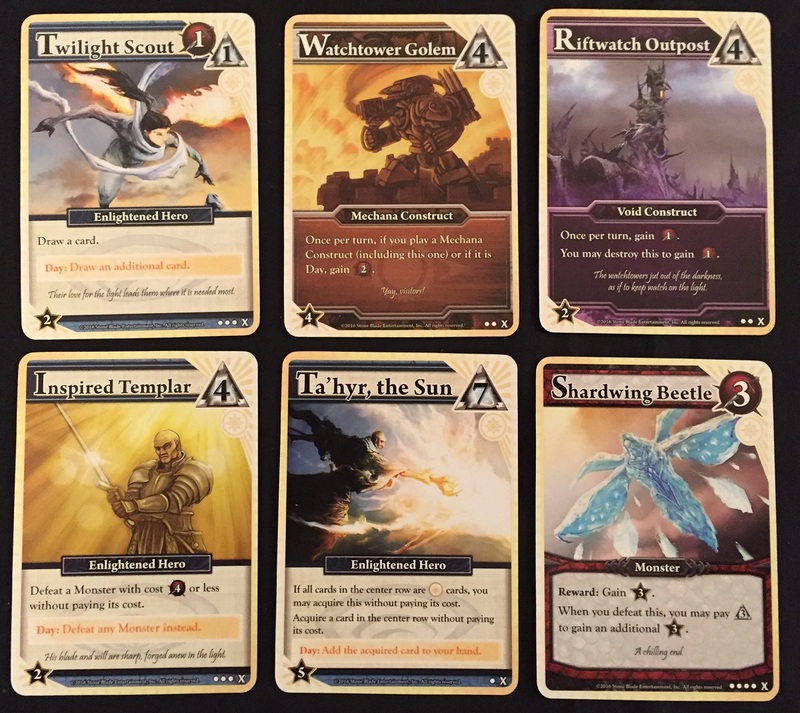 I always enjoy seeing what Stone Blade will come up with for its Ascension expansions. They’ve introduced different resource types. They’ve had a set where you get a personality at the start of it. They’ve done all sorts of things to make sure each one feels like a different game. In general, I like the Day/Night mechanic. It makes you think out your turns a bit more strategically than some previous sets, because after you buy/defeat a Center Deck card, it might just change from Day to Night and suddenly your other cards might not be as effective. I also like the dual-cost cards. It causes you to throw in some Power into your deck so you can hopefully buy those cards later. In other sets, you could totally eschew the Power cards to just get as many Runes as you possibly could. The bit about making Mystics and Heavy Infantry a more-integrated part of your deck is also nice. So, all in all, a nice addition to the collection. War of Shadows isn’t available in general release yet, but it is available for pre-order. Or, if you catch up with Stone Blade at one of the shows they’re going to, I’m sure you’ll be able to pick up your own copy.